1.9F and 2.6F Pediatric Catheter sizes in 20cm and 50cm lengths with radiopaque tip identifiable under X-ray. Polyurethane material provides strength, control during insertion, and higher flow rates with less chance of occlusion in a smaller French size. From the smallest to the largest ï¿½ and now everyone in-between ï¿½ Medcomp® has a catheter size for any pediatric patient. 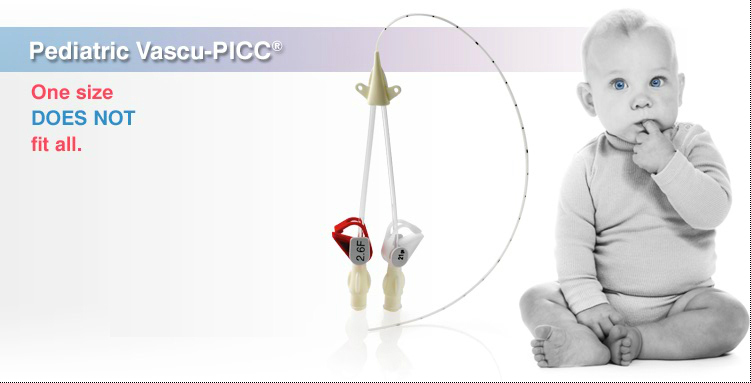 Pediatric Vascu-PICC® TLS Catheters is the latest addition to our PICC product line and features a dual lumen configuration, soft polyurethane body, and high flow rates in a small French size. Since smaller veins require greater precision, it only makes sense to offer you more choices in PICC sizes.